Following in Jimmy Carter’s footsteps in yet another way, President Obama plans to lift travel restrictions to Cuba. President Barack Obama plans to lift longstanding U.S. restrictions on Cuba, a senior administration official said, allowing Cuban-Americans to visit families there as often as they like and to send them unlimited funds. 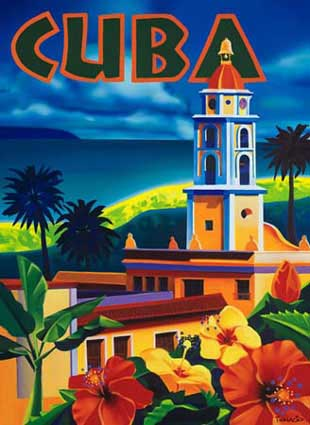 The gesture, which could herald more openness with the Castro regime, will fulfill a campaign promise and follows more modest action in Congress this year to loosen travel rules. In as far as it goes, this is a good thing. 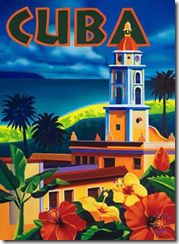 I can think of no worthwhile reason for the U.S. to restrict travel to and from Cuba, nor of any strategic objective that is served by keeping the country isolated and dirt poor. Unfortunately, Obama apparently doesn’t plan to call for an end to the trade embargo with the island nation, site of President Kennedy’s abortive Bay of Pigs coup attempt. Some Cuban-American circles have pressed to maintain U.S. restrictions because of their antipathy for Fidel Castro and his brother, Raul, who replaced him as leader after Fidel became ill. “How do you help people speak out about human rights violations if you’re basically extending the dictatorship abroad?” said Mauricio Claver-Carone, director of U.S. Cuba Democracy PAC. I hate to point it out, Mauricio, but the Castro boys have been in power for over 50 years. Many countries have come and gone in shorter time spans. The fact that Fidel Castro and his ilk have held a nation hostage so close to U.S. borders is galling, certainly. But it’s time to accept that this thing has happened in Cuba and move on, even if it means that Cuban-Americans have to accept that there’s not going to be a triumphant return home at the fall of the dictatorship. There is also the question of whether flow of trade with Cuba would be more or less likely to lead to economic and governmental reforms there. I think it opens the door to change because a people starved for trade and prosperity will demand it once it becomes possible. US Secretary of State Condoleezza Rice says Washington is strongly opposed to Taiwan’s plan for a referendum on United Nations membership. Ms Rice said applying to the UN in the name of “Taiwan” was a “provocative policy” – it raised tensions in the Taiwan Strait “unnecessarily”. Taiwan has failed to join the UN under its formal name, Republic of China. Beijing regards Taiwan as its territory and has blocked its bid to regain a UN membership the island lost in 1971. It’s a sad thing to see one’s country fail to honor a friend and ally, even if circumstances make it seem necessary. Communist China has claimed sovereignty over democratic Taiwan since the Chinese civil war ended in 1949, and Beijing has threatened to use force if the island formally declares statehood. Washington switched diplomatic recognition from Taipei to Beijing in 1979, recognizing “one China,” but remains Taiwan’s biggest ally and is obliged by the Taiwan Relations Act to help the island defend itself. In the present it certainly seems clear that the U.S. ought to back Taiwan’s bid for independence on principle alone. The right to self-determination is, at both a personal and national levels, the most fundamental of all rights and the one on which the U.S. was founded. I would have thought our president would have understood that. After 60 years of living in the shadow of Communist China, Taiwan deserves to choose its own destiny with the support of all free people, President Bush’s opinion notwithstanding, and without the brandishing of weapons on the part of its gargantuan, bellicose, bullying neighbor to the west. The Venezuelan people emerged victorious after the referendum that would have granted President Hugo Chavez vast powers to further the conversion of the South American nation’s economy into full-fledged socialism. In Caracas, Valencia, Maracaibo and other major cities, large crowds spilled into the streets, shouting, chanting, clapping and waving flags. 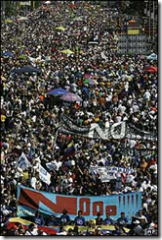 One man carried a sign proclaiming, “Vota No,” which by Monday was more an exclamation than an imperative after voters the day before dismissed 69 proposed amendments to Venezuela’s 1999 constitution. Chavez refuses to accept defeat gracefully, however, saying that he will keep pushing his agenda until voters get tired of rejecting him. One of the more controversial proposed amendments would have abolished term limits, allowing Chavez to hold office indefinitely as long as he is re-elected. The 53-year-old Venezuelan president, who was elected in 1998 as the country’s youngest-ever president, has twice been re-elected by large margins. However, the present law prohibits Chavez from seeking re-election when his term ends in 2012. Another amendment on the ballot would have pushed the country more toward socialism. Chavez has said he should have full authority over the autonomous Central Bank as well as the nation’s economic policy. 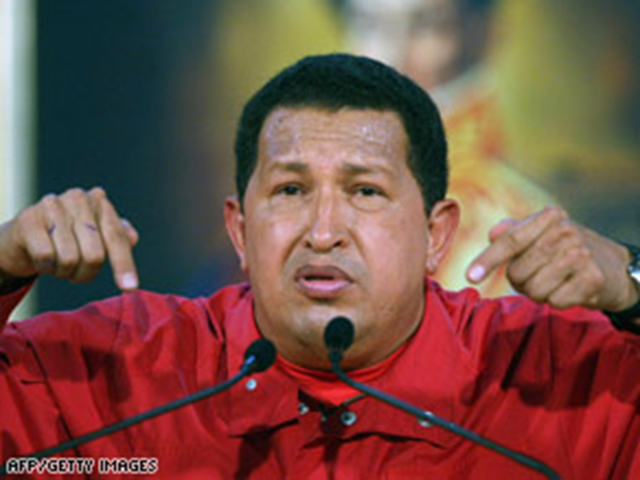 These measures, Chavez has said, are necessary to move the economy toward socialism. The measures are indeed necessary because, as we’ve now seen, the Venezuelan people are not convinced that implementing an economic system that has failed miserably in every country in which it’s been tried is a good idea. And some of them are smart enough to recognize that today’s triumph is not the end of the battle. Many of Monday’s revelers were university students who had worked doggedly to defeat the proposals. They burst into singing the national anthem upon hearing news that their efforts paid off. It could be; however, that does not seem likely. Chavez will undoubtedly cling to power and use his position to implement his ideas piecemeal now that the wholesale approach has been turned back. Indeed, one wonders if Chavez will now govern the country to the best of his ability given the outcome of the vote or if, like a dirty prize fighter betting the wrong way, he will take a dive in order to get a bit of payback out of those who voted against him. A functioning economy creates no need for his preferred type of government. Might he deliberately create circumstances in which the people find his kind of help appealing enough to pawn their freedom? As of now there is no overt reason to think so. Yet one thing is certain: Venezuelans cannot afford to take more than a brief moment to enjoy the freedom they still enjoy before becoming vigilant once more. In two weeks, Venezuela seems likely to start an extraordinary experiment in centralized, oil-fueled socialism. By law, the workday would be cut to six hours. Street vendors, homemakers and maids would have state-mandated pensions. And President Hugo Chávez would have significantly enhanced powers and be eligible for re-election for the rest of his life. A sweeping revision of the Constitution, expected to be approved by referendum on Dec. 2, is both bolstering Mr. Chávez’s popularity here among people who would benefit and stirring contempt from economists who declare it demagogy. That popularity, referred to by many other papers and web sites and undoubtedly boosted by the inevitable human response to the promise of free stuff, seemed undeniable and undefeatable. 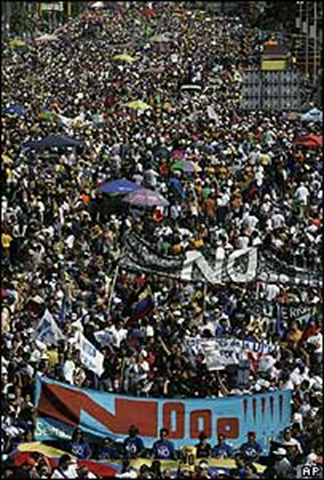 Yet today that seems to have changed as over a hundred thousand protesters came out of the shadows to demonstrate against the sweeping consolidation of power that Chavez proposes to make his legacy to Venezuela. The crowds gathered in Caracas oppose the planned changes, which include the removal of presidential term limits. They accuse Mr Chavez of a power grab but supporters say the changes will deepen Venezuela’s democracy. It is the latest in a series of student-led rallies, ahead of the “yes” campaign’s final march on Friday. However, correspondents say the “no” campaign is gaining force. No official crowd estimates were available but an opposition politician put the figure at about 160,000. What do the student protesters want? The students say they want the referendum postponed to give voters more time to study the plans. The Chavez government isn’t interested in their opinion, nor does it want the voters to study the plans or think too much about the long-term negatives of a socialist economy. …the government has described the demonstrations as an opposition effort to destabilise the country ahead of the referendum on 2 December. Earlier this month troops used tear gas and water cannon to disperse a rally, and last week gunmen opened fire on a peaceful protest march. Students preparing to march from the Central University of Venezuela in Caracas were undeterred, and said they would do all they could to defeat the referendum. Good for them. While I hope that none of them are maimed or killed for opposing the megalomaniacal Chavez, it’s necessary for them to inject their views into the debate now, while there’s still a slim chance of affecting the outcome. I think the cookie maker must have had some insight into Venezuelan politics.